Royal Apartment 121, or Shimmer, is a great choice for families traveling together. There’s three bedrooms, and only two have access to the terrace. Royal Westmoreland is a great place to stay, because there’s a golf course, tennis facilities, a big pool, private beach club, and fitness center. It’s near Mullins Beach, which is one of the most popular beaches on the island. If you want to be in a high end complex with resort amenities, Shimmer is for you! 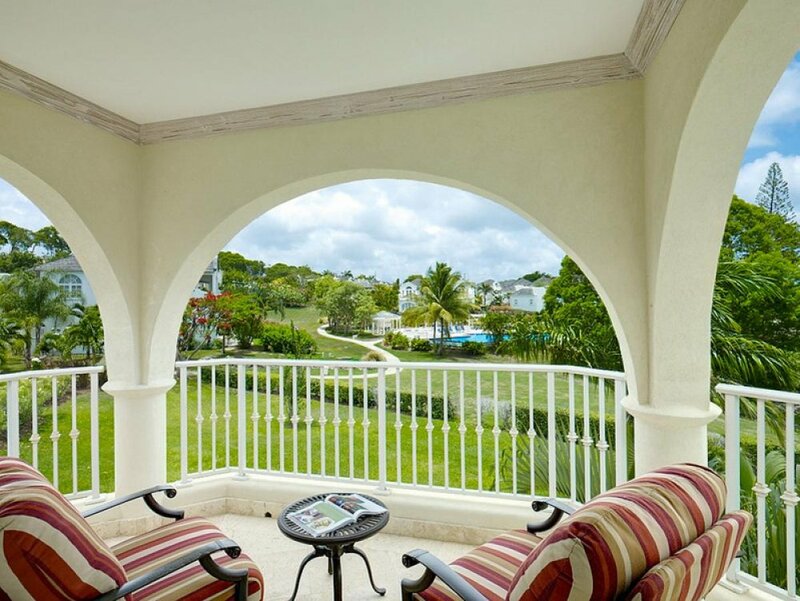 Shimmer, Royal Apartment 121 is part of the Royal Westmoreland Estate, and guests have access to a world-famous golf course, private beach club, resort pool, tennis courts, and fitness center. Mullins Beach, one of the most popular beaches on the island, is only 5 minutes away. Shimmer has a huge balcony with chaise lounges, al fresco dining, and a breakfast nook that looks out over the gardens. The living room opens to the balcony via large sliding glass doors, and has a flat screen TV, plush couches, and a ceiling fan. It blends with the kitchen, which has a breakfast bar, stainless steel appliances, an electric kettle, coffeemaker, and blender. The master bedroom is oversized, and has two sets of french doors that open to the balcony. It has a king-sized bed and an ensuite bathroom with a shower and tub. The second bedroom is bright, with several windows and access to a private balcony. It has a queen-sized bed and an ensuite bathroom. The third bedroom has a queen-sized bed, lots of windows, and a ceiling fan. At Shimmer, guests have a private cook to prepare three meals a day and a housekeeper. The property is gated, with 24 hour security. There’s a beach shuttle to Mullins Beach, and several restaurants on-site.